After passing the buildings of the Gouverneto monastery, go further entering a fairly well-prepared path, which after a dozen or so minutes of walking and passing the Bear Cave begins to fall along the slope of the mountain. Although the road is not particularly steep or demanding, it is better to go on this route with the right equipment. It will be a good idea to set up trekking sandals and supply yourself with a suitable water supply. The sun burns quite well here, so take a headdress for such a walk. The whole walk takes about 30 minutes, after which you reach an abandoned monastery picturesquely integrated into the rock wall. The Akrotiri Peninsula and Moni Katholiko are not on the list of optional trips organized by travel agencies, so only a few independent tourists reach this place. The popularity of this place is also limited by pedestrian access, where only the most curious people interested in the monuments of Crete will face up. The amazing atmosphere and the picturesque ruins of the monastery make this place very memorable and is on the list of the most unusual places in Crete. 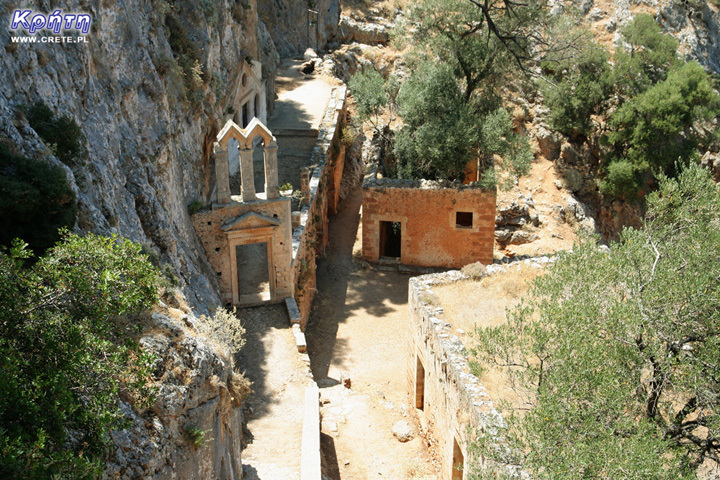 The history of Moni Katholiko dates back to the 10th century, when St. John the Hermit living in a cave located in the Avlaki ravine, founded a small monastery. After his death, the monastery was still being expanded by further local hermits and ascetics transferring to Moni Katholiko. The monastery remained inhabited until the 16th-17th century when after a series of pirate assaults the monks decided to leave this place. They founded and moved to a new monastery in the place of today's Moni Gouverneto. The current buildings of Moni Katholiko come from the 16th century, in addition to a stone-carved monastery in the Byzantine style, there are also monks' goals, warehouses and an impressive bridge. People with a good condition and having enough time can go on a further trip from this place. Following north from Moni Katholiko you can reach the picturesque bays, which in the old days served as a port. Redirected from the site - Moni Arkadi. The date of the foundation of Moni Arkadiou (Arkadi) is not exactly known. According to tradition, the name of this church refers to the name of the Emperor Arkadiusz, who supposedly was to be its founder. However, the current Renaissance building is much younger and comes from the 16th century.